Yorgos Lanthimos's The Favourite made me deliriously happy. It's not a particularly happy or uplifting story, but it is beautifully crafted and captivatingly clever. I curled up in my seat in the theater and luxuriated in the locations, the costumes, the performances, the writing, the camerawork - all of it seduced me, in much the same way that Emma Stone's cunning social climber Abigail seduces Olivia Colman's emotionally turbulent Queen Anne: just when I thought I knew what was happening and where it was all going, the movie would slap me across the face, or shove me into a ditch, and I would feel completely caught off guard, equal parts disoriented and impressed. And I couldn't get enough of it. 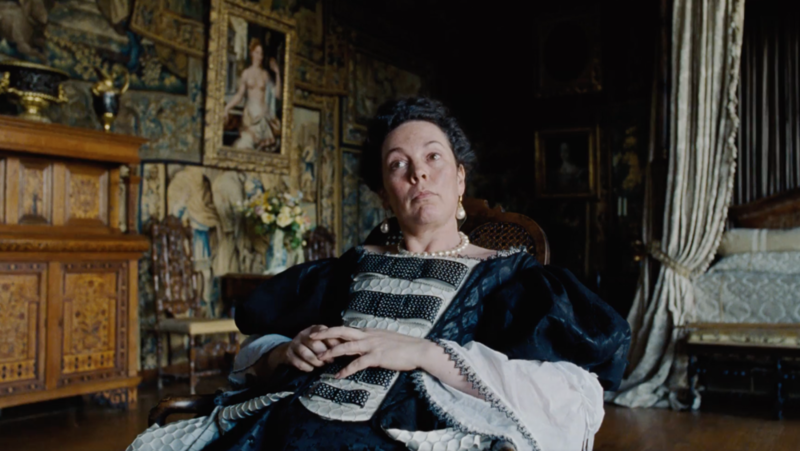 While it does draw inspiration from historical figures and events The Favourite is an atypical period film. Much of the story has been based on speculation or outright fabricated. The filmmakers have been very clear about this, that it was not their intention to create an historically accurate biopic of Queen Anne and this moment in time at her court. And while it certainly looks and, mostly, sounds the part of a well-bred prestige costume drama the movie's got a sly, subtle contemporary streak running through it. Characters are often more plain spoken and transparent than I was prepared for them to be, motivations and sensibilities seemed more modern, and more tangible than they sometimes do in a historical drama. Everything is closer to the surface, it all felt more accessible and relatable. That closeness, that sense of relatable-ness is due in part to the humor in the movie, which ranges from cutting and acerbic to gleefully immature. I often felt like I was watching Dangerous Liaisons as interpreted by Monty Python. And as the political machinations advance and the power plays amp up so does the absurdity. Many of the laughs come at the expense of Colman's hapless monarch, who initially comes across as blissfully ignorant and out of her depth on her best days, and as infantile, spoiled and dangerously self-centered on her worst. Colman, intoxicatingly adorable woman that she is, can easily convey a bumbling childlike quality, but to assume that's all there is to her Anne would be a mistake, and those characters who underestimate her often come to realize, far too late, that they've done so at their own expense. There is a scene, somewhere around the halfway mark in the movie, that I keep coming back to, because it was the first moment I really understood that this was more than a broad, bruising, historical farce. Queen Anne is walking down a corridor alone, in a state of agitation. In virtually every scene she is attended by someone but, in this moment, she is alone. The enormity of this aloneness plays across Colman's face; She may be constantly surrounded by subordinates and sycophants but she is, in all the ways that really matter, on her own. A servant passes her, holding a baby, which Anne grabs and begins to sort of violently cuddle. We know it is not the Queen's baby, because we know, by this point in the story, that none of the children Anne conceived survived her. Some were miscarriages, some were stillborn, some lived for a few years, but all of them are lost to her at this point in her life. All seventeen of them. Seventeen. I can't even begin to imagine what effect that amount of loss has on a person. Up until that point The Favourite had been a darkly good time; caustic, bawdy, and great fun. And Anne's neediness, her absent-mindedness, even her poor health, had been played for laughs. So when the story takes a breath, allows us into this very intimate, very personal, very vulnerable moment with this character, it's impossible not to feel for her, and to respect the movie for not just allowing us to bear witness to this moment, but for insisting that we do. There is one other moment, towards the end of the movie, that also sticks in my mind. Sarah Churchill, Duchess of Marlborough (a commanding, spellbinding Rachel Weisz), has long enjoyed the perks that come with being the Queen's closest friend and confidante. But she has been undone, cast aside in favor of her younger cousin Abigail, who has managed not only to endear herself to the Queen, earn her trust and adoration, but to cast doubt on Sarah's own affection for and loyalty towards Anne. Sarah, desperate to regain her good standing, tries to reason with Anne, and convince her old, dear friend to turn on Abigail. That Abigail is in it for herself there can be no doubt, though she plays her part well and it's not hard to see how Anne would be captivated by her considerable charms. And while Sarah is the more sensible, the wiser, more capable and trustworthy choice for a companion, it's easy to assume she's really in it for herself, too, just like her conniving young cousin. This is why the scene with Anne and the baby resonated with me so strongly when I saw it. "This poor woman," I thought. "No one really loves her, they only love what they can get from her." But I didn't feel that way by the end of the movie. Maybe I'm intentionally mistaking Sarah's self-interest for something purer, because I can't bear the thought that no one truly loves Anne. But I didn't come away from the movie believing that. I do think there is an actual love story buried at the heart of The Favourite. It's those quiet little moments, the ones that suggest genuine affection between these two women, that make the movie so exquisite. Because it's so unexpected, so subtle, but, underneath all that artifice, it's there all the same. I've spent the past ten months furiously attempting to catch up on all the movies and series that have managed to slip past me over the last few years. For the most part, the titles I enjoy and admire the most (The Handmaiden, Thelma, and The Duke of Burgundy immediately come to mind) are the ones that feature queer female characters in their leading roles. Romantic / sexual relationships are a vital part of each story but not always the primary focus. What makes these stories compelling is a focus on complicated female characters and a decided lack of emphasis on the male gaze (the irony that all these films were directed by men is not lost on me) - an acknowledgment that women do not have to be deified or villainized in extraordinary fashion in order to be compelling, or used as props for leading men, or waste their time trying to endear or ingratiate themselves to men, or even concern themselves with what the men are doing or how their own actions might be affecting them. These women have their own stories to tell. And sometimes those stories aren't heroic or uplifting. And sometimes the women don't look fabulous while they're going about the business of being complicated and fascinating. Sometimes they're middle aged and overweight, un-corseted, gout-ridden and wearing eye makeup that makes them look like a badger. Some of the most celebrated male roles are those that revel in their characters' flaws, their actual human-ness. It shouldn't be so uncommon for women to feature in similar parts, yet somehow it still feels revolutionary, because it happens far too infrequently. I loved spending time in the company of these women. I loved these women. I loved this movie.